WASHINGTON (Reuters) - President Donald Trump, cleared by Special Counsel Robert Mueller of conspiring with Russia in the 2016 U.S. election, vented his anger on Monday at the inquiry and vowed investigations into unnamed political enemies who did "evil" and "treasonous things." The Republican president and his allies in Congress went on the offensive a day after the release of a summary of Mueller's report gave him a political victory ahead of his 2020 re-election bid, with no allegations of criminal wrongdoing brought against him at the end of a nearly two-year-long inquiry. "There are a lot of people out there that have done some very, very evil things, very bad things, I would say treasonous things against our country," Trump told reporters at the White House, without mentioning anyone by name or citing specific actions. Senator Lindsey Graham, the Republican Senate Judiciary Committee chairman and a Trump ally, told reporters he would ask Barr to appoint a special counsel to investigate the origins of the Russia probe. Graham said Barr told him in a telephone call that he would be willing to testify to the judiciary panel about the Mueller probe, according to a spokesman for the senator. Trump pledged new investigations but did not specify who would conduct them or who should be targeted. Trump in the past has called for investigations of Hillary Clinton, the Democrat he defeated in 2016. "Those people will certainly be looked at. I've been looking at them for a long time," Trump said in the Oval Office sitting alongside visiting Israeli Prime Minister Benjamin Netanyahu. "And I'm saying: Why haven't they been looked at? They lied to Congress. Many of them. You know who they are." White House spokeswoman Sarah Sanders called for congressional hearings to investigate prominent Trump critics including former U.S. Director of National Intelligence James Clapper, former CIA Director John Brennan, Comey and other FBI figures. In an appearance on NBC's "Today" program, Sanders said: "The media and Democrats have called the president an agent of a foreign government. That is an action equal to treason, which is punishable by death in this country." Asked if Trump owed Mueller an apology, Sanders added: "I think Democrats and the liberal media owe the president and they owe the American people an apology." The end of the Mueller inquiry did not spell the end of the investigative pressure on Trump. Democrats gave no indication of easing up on their multiple congressional investigations into his business and personal dealings. Graham said it was time to look at the Clinton campaign and the origins of a Foreign Intelligence Surveillance Act (FISA) warrant for former Trump adviser Carter Page, which was based in part on information in a dossier compiled by Christopher Steele, a former British intelligence officer who co-founded a private intelligence firm. The inquiry was first handled by the FBI and then by Mueller after the president fired the agency's director, James Comey, in May 2017. Republicans said the FBI failed to disclose that Steele was hired by a firm funded by Democrats to do opposition research on Trump's business dealings. "I love this country as much I can love anything: my family, my country, my God," Trump said. "But what they did. It was a false narrative. It was terrible thing. We can never let this happen to another president again." Trump had repeatedly accused Mueller, a former FBI director, of running a "witch hunt" with a team of "thugs" and having conflicts of interest. But asked on Monday if Mueller had acted honorably, Trump said: "Yes." Trump also said he had not thought about pardoning anyone convicted or who pleaded guilty in the Mueller probe. They include several of his former aides such as former campaign chairman Paul Manafort, former national security adviser Michael Flynn and former personal lawyer Michael Cohen. The special counsel also detailed extensive contacts between Trump associates and Russia. A fierce fight was brewing over how much of Mueller's findings should be made public, and Democratic lawmakers who control the U.S. House of Representatives, were likely to face a protracted legal battle that will turn on Trump's right to keep communications with his advisers private, legal and political experts said. One of Trump's lawyers, Jay Sekulow, said at least part of the report should be withheld. Sekulow said it "would be very inappropriate" to release the president's written answers to questions posed by the special counsel, calling the responses provided in November confidential. After lengthy negotiations, Trump reversed his previous stance that he would be willing to submit to an in-person interview with the Mueller team, ultimately agreeing only to provide written answers. Mueller, who submitted his confidential report on his findings to Barr on Friday, neither accused Trump of obstruction of justice in trying to impede the investigation nor exonerated him of obstruction, according to the summary. 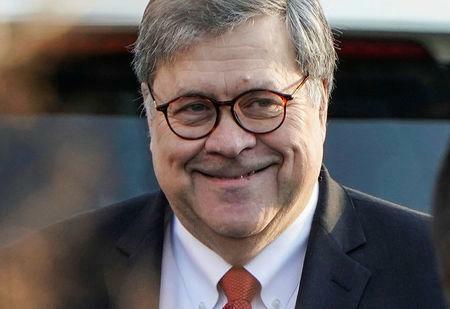 Barr said he and Deputy Attorney General Rod Rosenstein, who appointed Mueller, concluded the investigation's evidence "is not sufficient to establish that the president committed an obstruction-of-justice offense." The Mueller investigation had cast a cloud over Trump's presidency but he has declared himself fully exonerated, despite what Barr's summary said on the obstruction of justice issue. On March 5, Mueller visited the Department of Justice's main office in Washington to meet with Barr and Rosenstein and told them he would not be reaching a conclusion with respect to obstruction, a decision that was unexpected, a department official said. A person familiar with the matter said there were no plans at this time to show the Mueller report to the White House. Trump said on Monday that "it wouldn't bother me at all" if the report were released but that it was up to Barr. The Kremlin said on Monday that President Vladimir Putin was ready to improve ties with the United States following the release of Barr's summary and called on Washington to formally recognize there was no collusion. Russia repeated its denial of U.S. intelligence agencies' findings that it meddled in the election. Mueller, in previous legal filings, described a Russian campaign to interfere in the election through hacking and propaganda to sow discord in the United States, harm Clinton and boost Trump. Mueller charged 12 Russian intelligence officers, 13 other Russians accused of taking part in a disinformation campaign and three Russian companies.